What should you expect after getting your brows done? We get this question all the time. For many people inquiring about getting permanent makeup, the healing time is seen as the scary part. But fear not! Since we focus more on natural styles of brows, the healing really isn’t anything to be afraid of. Some clients even prefer their brows when they are going through healing since the brows will look very fresh especially the first couple of days. Remember, the healing time is only temporary. For most, it only takes two weeks. So let’s get to it! After getting your brows done, the results look the best the first two days before the healing process begins. For those two days, make sure you do not touch your brows. We know it can be soooooooo tempting to touch those beautiful brows to make sure you’re not dreaming, but leave them alone. On the third day, you will begin to apply a small amount of grapeseed oil to your brows to give them a bit of moisture and aid in the healing process. Don’t worry about having to find this oil most people have never heard of since we will provide you with a jar of it before you leave. Dab a small amount on your brows morning and night, then dab dry with a clean tissue. Simple, right? We ask you to do this for 2 weeks to obtain optimal results. During those 2 weeks, your brows will go through stages and you will go through mixed emotions about them! You’ll love them at first, but you’ll then realize they got darker and thicker. The scabbing process happens right after and you’ll lose some color depending on your skin type. DON’T WORRY! This is temporary and the color will come back! Once the color comes back, you’ll then know what you want to add, darken, or fill-in on your touch up! Remember this is a layering process so that second session is crucial. What should you avoid during the healing process? After having your brows done, keep the area dry and makeup-free. Basically, leave those babies alone! No touching except for applying and removing the oil. Also, avoid any skin products with Retin-A, Glycolic Acids, or Peroxide. This also means no facials, Botox, or fillers. These things can compromise color retention, which is something we don’t want. So, there you have it! Now you know everything you need to know to take care of your brows. 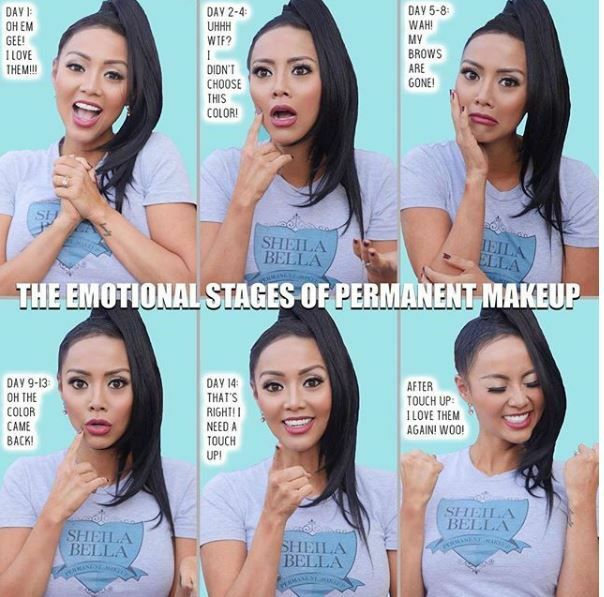 You can also refer to the photo featuring the Emotional Stages of Permanent makeup for your entertainment (though it is very accurate! ).